Bougainvillea, native to South America and specifically Brazil, is one of the most popular tropical plants used for mass color effect. A woody vine with stiff thorny stems, it can reach enormous proportions when left to ramble. The spectacular show of profuse bloom is what makes it so effective in tropical plantings especially when allowed to cascade over fences or other supporting structures. 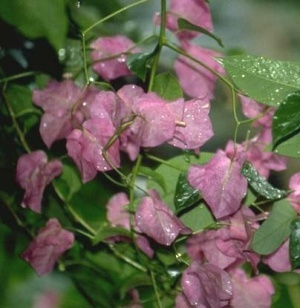 Although a vine, bougainvillea can be maintained as a shrub or trained as a standard by selective pruning. The natural flowering period is after the summer growing season during the cooler months of winter and spring. However, under ideal conditions there will be flowers year round. Wait until flowers have faded and before new growth starts to prune plants. They are able to withstand severe pruning. There are many varieties and colors of bougainvillea including purple, pink, white, yellow, orange and red with purple being the most favored and often used in landscaping. Foliage is a pleasant medium green consisting of heart-shaped leaves. There are also cream on green variegations which makes them attractive even when not in bloom. The actual flowers are white and rather inconspicuous. The mass color effect is due to the papery bracts surrounding the flowers. Bougainvillea will grow year round in mild temperature regions. Plants will be damaged by frost and freeze at 32 degrees but usually come back if not exposed too long and temps do not dip too low. Always plant bougainvillea in full sun. They are fairly drought resistant and won't require much more water than natural rainfall provides. Plants also have good salt tolerance which makes them useful when planted near saltwater where other plants fail. They are not critical of soil but prefer pH of 5 to 6 which is slightly acidic. However, there is a fairly high potash requirement and deficiency will be apparent by yellowing leaves. To easily correct this condition, you can broadcast a little dry fertilizer including potash or use a water soluble product to spray foliage. Don't over fertilize bougainvillea. This will result in lush growth but at the expense of bloom. Although tropical in nature, bougainvillea can be successfully grown as container plants indoors in cooler climates, so long as there is sufficient sunlight. They also make excellent subjects for bonsai. The most common pest is the bougainvillea looper caterpillar. Either brown or green in color, it is a master of disguise and a very voracious feeder. Their presence is easily noted by jagged edges on foliage, especially near the tips of branches. They like to hide within rolled up leaves during the day. It is a mystery how these pests who feed almost exclusively on bougainvillea can locate one plant even if there is not another for miles around. To control, spray plants with a neem based insecticide or dust with Sevin or permethrin late in the day when there is little air movement.